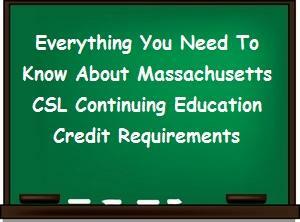 In July of 2011 the MA Department of Public Safety (DPS) announced that it was requiring continuing education credits (CEUs) to renew all categories of CSL license types in Massachusetts. When it’s time to renew your MA CSL License you will need to send in certificates of completion from the CSL CEU credit classes you have taken. 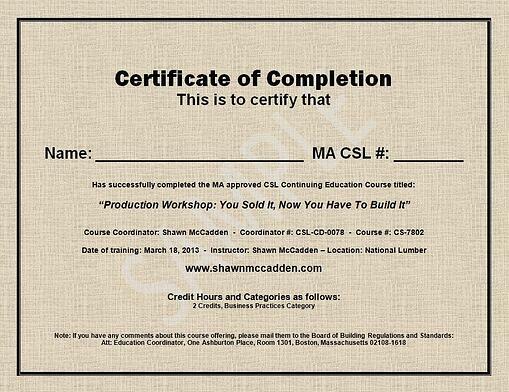 Make sure the CSL completion certificates you get from your course instructor include the information you will need to validate the classes you took were approved for credit and that they give you credit in the specific required credit categories you will need to renew your specific Mass CSL license type. Copies of your completion certificates must be included with your MA CSL renewal application at the time of renewal. Be sure to store your completion certificates where you will find them when you need them. In case you lose one or more your course completion certificates make sure you have the information you need to contact any of the MA Approved CSL Coordinators who offered the classes you attended so you can request a replacement certificate.